WE regret to have to record the death of Mr. Harold Gwynne Allen, M.A. (Cantab), which occurred in London, last Friday, January 22. Mr. Alien, who was eighty-five, was, until his retirement at the end of last June, a deputy chairman of W. H. Allen Sons and Co., Ltd., Bedford. He had devoted life-long service to the company, including a period of over fifty years as a director and, from 1928 to his retirement, as a deputy chairman. He was the father of Mr. W. Kenneth G. Allen, the present chairman of the company, and of Mr. H. Norman G. Allen, managing director, and was the third son of Mr. William Henry Allen who founded the business in 1880. Harold Allen was educated at Westminster School and Trinity College, Cambridge, subsequently obtaining his engineering training at Queens Engineering Works, Bedford and the Fairfield Shipbuilding and Engineering Company, Ltd., before being appointed to the staff of W. H. Alien Sons and Co., Ltd.
For many years Mr. Harold Alien was responsible for the administrative and. commercial work of the company and he played a dominant part in the successful development of its world-wide organisation and business activities. He inherited many of his father's characteristics - foresightedness in business, thoroughness and directness in method, and a readiness to recognise and help initiative and enterprise among the young people in the firm. Throughout his business life, Mr. Harold Alien endeared himself to the personnel of all sections of the Allen organisation and the numerous associates who worked closely with him had ample opportunity of observing his qualities, both from the business and social points of view. It was always recognised in dealing with the problems associated with a large business that Mr. Harold Alien possessed outstanding tact and acumen. Every problem, large or small, received the fullest consideration before a decision was given. His determination and fairness, together with his charm of personality, won for him the sincere goodwill of all members of the organisation. Mr. Harold Allen was also a well-known personality in all branches of the engineering and many other industries as well as in Naval and Mercantile Marine centres and other different spheres. He travelled extensively for the purpose of furthering the interests of the company's business. Despite his advancing years, he maintained a keen and active interest in the firm's activities and was regularly at the London office up to his retirement. One of Mr. Harold All en's main interests was that of technological education combined with engineering training; it is true to say that he was personally instrumental in steering a course for the future careers of many engineers who are to-day holding important positions in all parts of the world. He was especially concerned, not only with the students' and apprentices' training and education courses, but also with their spare-time social activities, in particular the running of the Allen Boys' Club, which flourished for many years between the two world wars. An annual event which will always be remembered by numerous young apprentices and members of the Boys' Club was the outing to the Royal Tournament at Olympia, when they were the guests of Mr. Harold Allen for the day. In his earlier years, Mr. Harold Allen made a notable contribution to the industrial life of Bedford and, in addition, he will be remembered in the town and county for his public-spirited service to the community in civic and other spheres, in particular, as the High Sheriff of Bedfordshire in 1925. 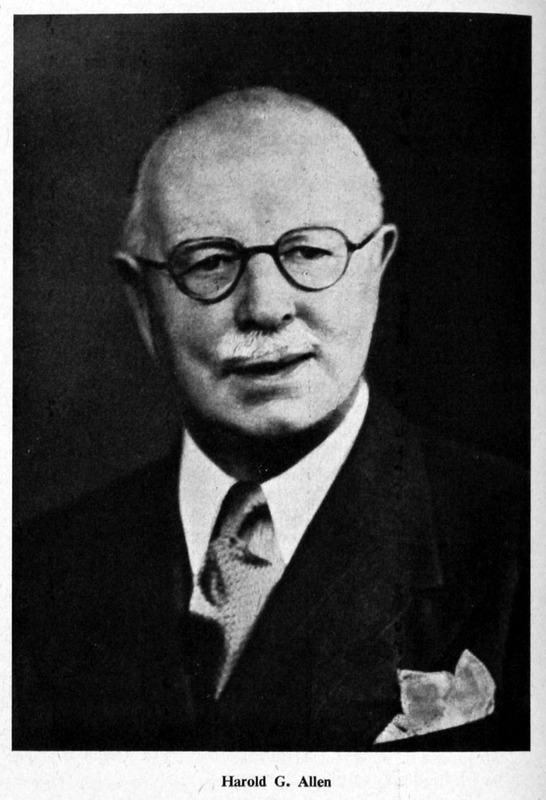 In addition to his normal business responsibilities with the company, Mr. Harold Alien also devoted much time and rendered valuable assistance to the work of a number of important bod1es, including the council of the British Electrical and Allied Manufacturers' Association and the Grand Council of the Federation of British Industries. He was also a member of the Institutions of Civil Engineers and Mechanical Engineers. Apart from his business activities, he had a deep love of music, art and literature, and also had a genius for being friendly and g1ving help and gu1dance. These attributes together with his interest for the well-being of the company's junior employees, led to Mr. Harold Allen giving talks to the students and apprentices with a view to creating a real enthusiasm for life as the only way to the attainment of success. Harold Alien never had a personality as strong as that of his brother the late Sir Richard Allen; but in strength of mind and character he matched him. To the great benefit of the firm their interests were complementary as much as similar. Thus while Sir Richard played an active part in the affa1rs of the Institution of Mechanical Engineers and was its president in 1928 and was equally active in other public ways' becoming very widely known and respected by engineers the world over, Harold devoted h1mself wholeheartedly to the business interests of the firm and the similar interests of engineering firms in general. Probably it was as much through his sagacity as through any one else's that his firm survived relatively less scathed that many others from the years of deep industrial depression of the thirties. Much less widely known than his elder brother, he was just as much respected by those who did meet him on business and on the councils of B.E.A.M.A. and the F.B.l., and his work for the firm was invaluable. Perhaps his outstanding service to the firm was to bequeath to it two sons in whose hands, primarily, its fortunes now rest. Mr. Harold Gwynne Allen, M.A., who died on 22nd January at the age of 85 was the third son of William Henry Allen, founder of the firm of W. H. Allen, Sons and Company, Ltd., of Bedford. After being educated at Westminster School and Trinity College, Cambridge, and acquiring an engineering training in his father's works and at the Fairfield Shipbuilding and Engineering Company, Ltd., he joined the staff of W. H. Allen, Sons and Company. For the rest of his life he devoted the greater part of his energies to ensuring that the firm flourished. For 50 years he was a director and he was deputy-chairman from 1928 until he retired only last June. It may surprise many of those who knew him that Harold Allen was never a president of a major engineering institution nor a chairman of any notable committee. For he certainly did not lack those qualities, such as strength of mind and firmness of character allied to a readiness to listen to the views of others, which go to the making of a good chairman. A probable explanation is that he never wanted to serve in such capacities. He did accept the honour of becoming High Sheriff of Bedfordshire in 1925 in recognition of the public-spirited service he had given and continued to give thereafter to the community in civic and other spheres. Nor was Mr. Harold Allen at all widely known, in the sense that public figures are widely known, in engineering. The reason was that he devoted himself so wholeheartedly to the business interests of his firm and to the similar interests of engineering firms in general. Probably it was as much through his sagacity as through that of any one else that his firm survived relatively less scathed than many others through the years of deep industrial depression of the thirties. He took an active part in the council work of the British Electrical and Allied Manufacturers Association and served with distinction on the Grand Council of the Federation of British Industries. This kind of work brought him a wide range of close acquaintances, people who met him on committee or during the extensive travels he undertook to further the business interests of his company. One other of his activities needs mention here. Indeed the present writer would never be forgiven if he did not refer to it! One of Harold's major interests was that of studying how technological education and engineering training could be improved; and he took a particular interest in the running of the Allen Boys' Club which flourished for many years at Bedford between the wars. He liked young people and young people liked and respected him. As a direct consequence it can truthfully be written that he was responsible for setting the course along which many an engineer holding an important position to-day steered his way to success. Harold Allen had a real enthusiasm for living and he believed that to have and to hold such an enthusiasm was one of the secrets of success. He had also a deep appreciation of music, art, and literature. But his main object in life was to serve rather than to ask for any return for what he did— to serve his company, to serve his profession, and to serve the community. Nobly he did so. One of his outstanding services was to bequeath to the firm he served so well in MR. H. G. ALLEN other ways two sons in whose hands primarily its fortunes now rest. Mr. Allen was elected an Associate Member of the Institution in 1902, and transferred to Membership in 1907. This page was last edited on 3 December 2017, at 20:06.